Inks: Ian the Green's Iron Gall, Kolner Miniatum Ink & Gold Leaf, Winsor & Newton Scarlet & Blue Calligraphy Ink. 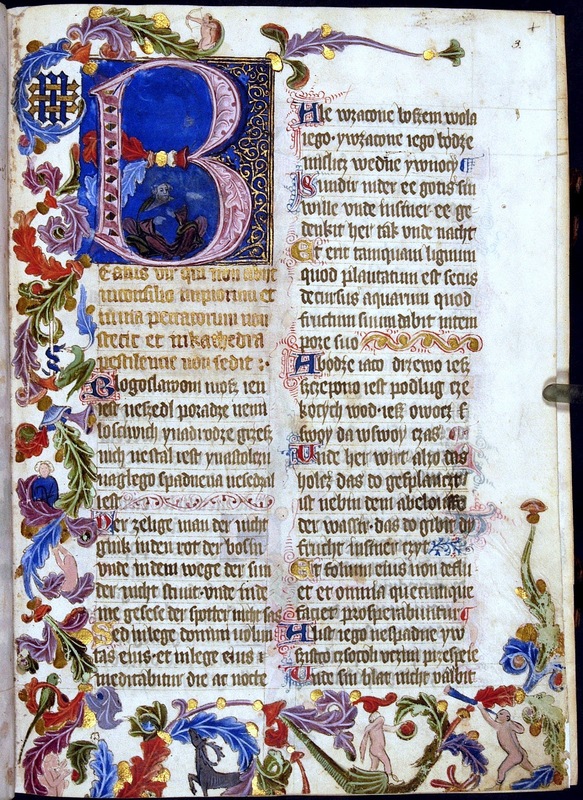 Inspiration: The Sankt Florian Psalter. Master Harold (my Great Grand Laurel) contacted me a few weeks before Great Northeastern War to ask if I could help with Astryda's scroll. Working with Astryda's husband, Stephen, we decided on the Sankt Florian Psalter as an inspiration to match her late 14th Century Polish/German persona. While the original was roughly 9x12", we decided to go a little smaller in scale and used 8x10" parchment with 1" borders for framing, resulting in a decorated area that is 6" wide by 8" tall. 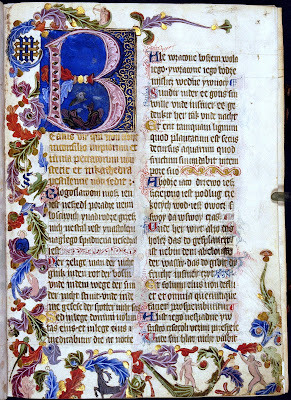 The inspiration: The beginning of Psalm I from the Sankt Florian Psalter. I couldn't determine if the original used scored, metal-point, or inked guidelines. I decided to go with scored guidelines to keep them subtle in appearance. For the first time ever I was going to work without my beloved pencil guides! I started by drawing widely spaced pencil lines on practice paper using my AMES guide. I practiced "floating" my lettering between the lines as they did in period instead of having my vertical strokes start and end at the pencil guides. As you can see in the final image, I managed to estimate the perfect size to have the text fill the page and still barely leave room for the signatures. 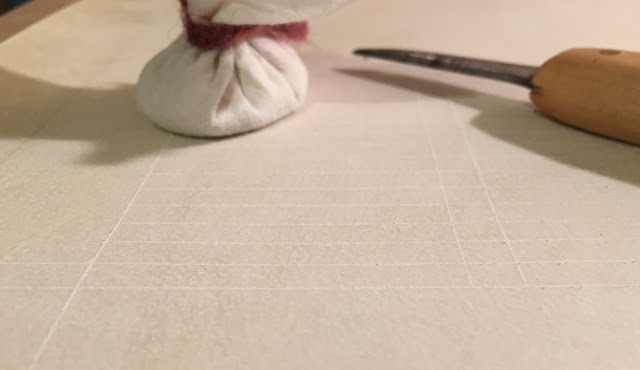 Once I was comfortable with the new technique and my size, it was time to line the parchment. I did use a pencil and my AMES guide at first: on the edge of the paper I penciled a scale of evenly spaced lines to use for reference. 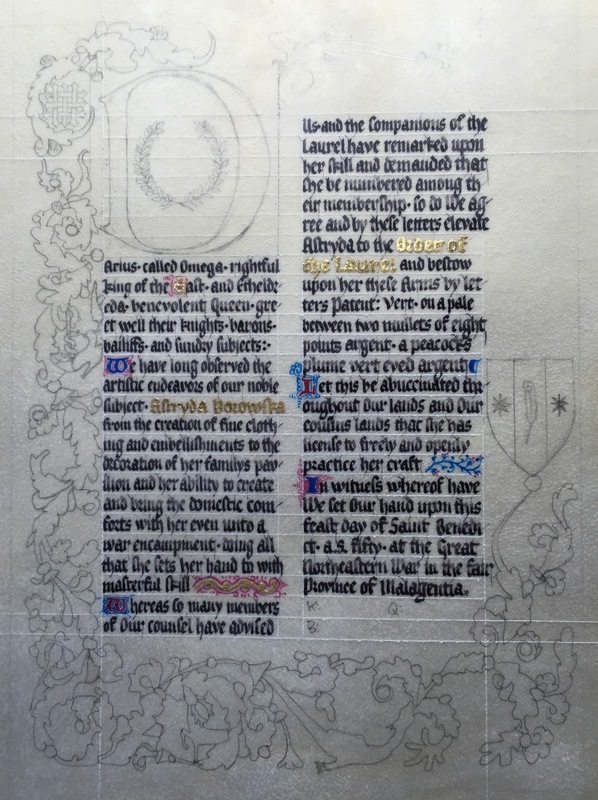 I then used the tip of my quill knife and my T-Square to gently score the guidelines into the surface of the parchment. The knife tip was a little sharp and instead of just denting the surface, it cut in just slightly. In the future I'll try to find a stylus and remember to place a few sheets of paper underneath to allow the surface to give under the pressure. Finally, I pounced the surface of the parchment with gum sandarac. Each column was about 2" wide. Here's a shot of the finished first column, with the quill I used and a US Dime (0.7" in diameter) for comparison. 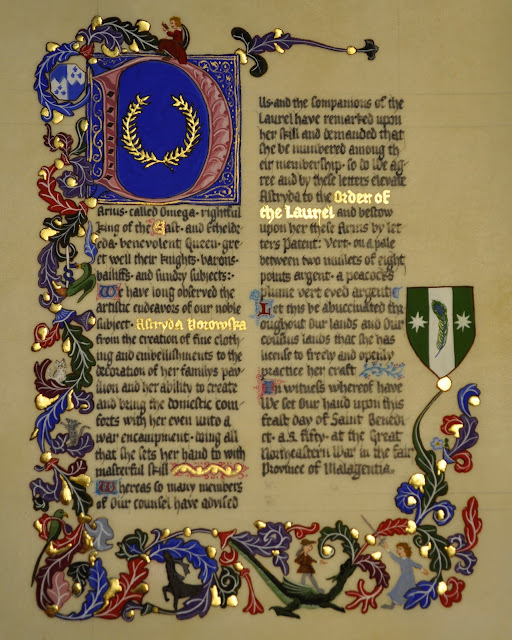 Astryda's name and the Order of the Laurel on the next column were penned using Kolner Miniatum Ink and then gold leafed. I left space for rubricated capital letters at the start of each paragraph, and for the E in East. 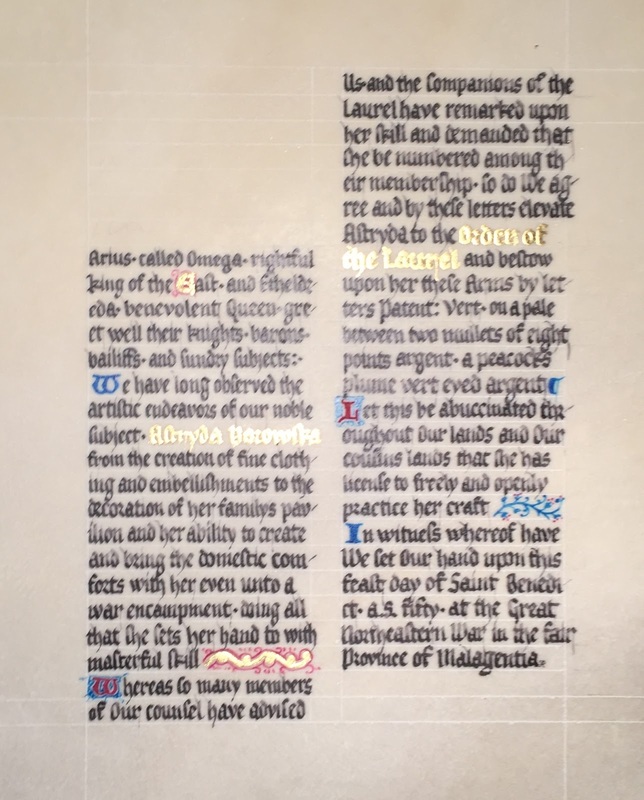 Here's the finished calligraphy, with some of the rubricated letters added, as well as some of the flourished doodles that fill the space at the end of the paragraphs. Camille asked me to assist with the layout before handing it off to her for gold leaf and paint. Once the rubrication was complete, I taped the parchment down to my light box over a printout of the inspiration, and penciled in the border elements. The versal B was changed to a D to match our wording. I left out the human figures so Camille could decide where & how to add them for personalization. I also added the Laurel Wreath and Astryda's arms. Some of the bottom border was made up as the original appears to have been trimmed. This is what the scroll looked like before handing it off to Camille. After Camille did her magic with Miniatum, gold leaf, and gouache, we have the completed scroll. Overall, I'm very happy. I can see some places where my headlines and baselines varied a little bit, but overall I'm pleased with my consistency. I don't think I'll be trying this technique on every project; there will be times where pencil lines are going to help me work faster with better consistency. When a recipient will really appreciate knowing I used a period method, I'm glad to know I can pull it off.